In French, there’s a term for making a noun out of another word, nominalization. (Nom means both name and noun in French.) We do it in English, too, but since I learned it in French, I think of it as a French linguistic term. I tend to do the opposite, stuffing nouns into action verbs as I see fit. There must be a word for this. Right now, for example, it’s falling outside. As in, fading and darkening and preparing to hibernate, forcing the last drops of summer out in fits of burstiful color to make room for what’s to come. I think a person could be falling, too, and not just like I did yesterday, stumbling to my knees on the hike down from our campsite. Yesterday, I was also falling when I started making applesauce: it’s a physical representation of reserving energy and gathering strength for a real or metaphorical winter. Fall has tended to be my worst time, in terms of lupus symptoms. Four years ago, this time of year, I felt the first aching pains of joint involvement, and started to notice how Raynaud’s Syndrome turned my fingertips first an eery shade of white, then filled them with blood, the ruddy purple tone reminding me just how much my skin hides underneath. The last three years, I’ve had time to rest in early fall. I’ve had mini hibernations, two weeks or so of a transition between a summer of personal cheffing and three seasons of writing and recipe testing. Now, fall is coming, and maybe I’m not falling enough, not getting ready. Not stopping. The warm, secure blanket of sunshine I’ve been cozied under since July 1st is suddenly gone, and I’m Wile E. Coyote, ten feet off a cliff but still running running, barely aware that the chasm below me could develop into a minor problem. Yesterday, when we got home from hiking, I plunged right back in while my husband spread our gear all over the backyard to dry. Writing calling reading cooking writing. Then the friends we’d been hiking with stopped by on their way out to grab a movie, admitting a three-hour nap had overtaken them the moment they’d walked in their door, and I saw it: I saw the ground below me, and my legs pumping, and wow, I should learn a thing or two from these people. But exactly how does one begin to slow down? My brakes don’t work very well. Last fall, I was fine. But last fall, at this time, I was sitting in an empty living room, waiting for a moving truck to arrive. Last fall, I was also on 15mg of prednisone, too high a dose for comfort, and today I hit 7mg, my lowest since the spring of 2006. I hope my body says yes. Rather, I hope I can do the things I need to do so it doesn’t say no. If only it would give me a list. That would be easier. I suppose I’ll have to make my own. Obviously, it’ll be a list of Not To Dos. It’ll start with Do Not Make Laps. That means slowing down, standing over a pot of fragrant, crisp apples, stirring them patiently into softness instead of bouncing back and forth from my computer at the same time. As always, freshly ground or grated spices give the most flavor, but even the tinned kind give this applesauce a kiss of spice that’s just a bit different from your typical cinnamon-loaded applesauce. Eat it for breakfast, or for dinner over pork chops or curried chicken. Place the apples in a large soup pot. Mix the sugar with the spices in a small bowl, pour over the apples, and stir to combine. Cook over low heat, covered, stirring occasionally, until the applesauce reaches desired consistency (about 1 to 1 1/2 hours). Leave the sauce a little chunky, or puree in a food processor or blender until smooth, and store in glass jars in the refrigerator, up to three weeks. Thank you! This is exactly the recipe I will want next fall when I finally have my own kitchen again. This is beautifully written, all the meanings of fall, falling for the idea of fall. 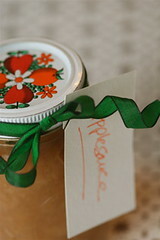 Chai-spiced applesauce sounds wonderful, worth slowing down for. Remember to breathe. And nap. I heart applesauce. Yum! I made this recipe last night to serve with coconut oven-fried chicken tenders. I used organic Granny Smith, organic Golden Delicious, organic Fuji, and local Macouns to make this and cored and chopped up the apples (I didn’t peel them). I put the apples in the crockpot, on high, and cooked them for ~3 hours. They smelled so wonderful and homey. I then added the spices, tasted, and it seemed sweet enough to me without a single spoonful of sugar. I pureed until smooth with my immersion blender and you can’t even tell that the skins were left on. WONDERFUL recipe, thank you! Perfect recipe for this evening! A la Brady Bunch I’m making pork chops and applesauce and this recipe will be the best!! LOVE reading Hogwash!